House dust mites are tiny creatures, about a quarter of a millimetre long. They live off human skin scales which have been partially digested by moulds and thrive in humid environments. 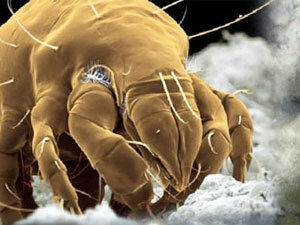 Mites are found in bedding, carpets, soft furnishings and clothing. In people allergic to dust mite, it is often not the mite itself but proteins in their droppings which cause the allergy. Each mite produces about 20 of these waste droppings every day and the droppings continue to cause allergic symptoms even after the mite has died. House dust mite allergy is very common and is associated with asthma, eczema and perennial allergic rhinitis. A significant amount of exposure to house dust mite allergen happens in the bed, so taking precautions in the bedroom by using allergy-proof covers on bedding, washing it regularly can sometimes help, although clinical trials suggest that multiple measures need to be taken, possibly including the use of chemicals called acaricides, in order to see an effect. However, remember that dust mite allergen is found in all rooms of the house, on the floor and in soft furnishings, not just in the bedroom. 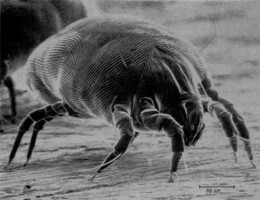 Measures to avoid house dust mite will lower, but do not totally remove, dust mite allergens. Often, this will be sufficient to significantly improve symptoms, but sometimes, the reduction may simply not be enough to result in a noticeable difference. There is no way to predict whether someone will benefit from avoidance measures, except by trying them. Remember that it is better to properly carry out several allergen avoidance measures in order to see an improvement in symptoms. Just doing one or two things half-heartedly may not make any difference. Most efforts at controlling dust mites should be aimed at areas of the home where you spend most of your time and where dust mite load is greatest, i.e. bedrooms and living areas. Use allergen-proof barrier covers on all mattresses, duvets and pillows. These should be breathable and should completely enclose the item. Buy products that have been tested to make sure that they prevent the escape of house dust mite allergen. Wash all bedding that is not encased in barrier covers (e.g. sheets, blankets) every week. Washing at 60 degrees centigrade or above will kill mites. House dust mite allergen dissolves in water so washing at lower temperatures will wash the allergen away temporarily, but the mites will survive and produce more allergen after a while. Allergic children should not sleep in the bottom bunk bed where allergen can fall onto them. If possible remove all carpeting in the bedroom. Vacuum hard floors regularly with a high-filtration vacuum cleaner (see below). Remove all carpeting from concrete floors. Such floors trap moisture allowing dust mites and mould spores to thrive. Seal the floor with a vapour barrier, and then cover it with a washable surface such as vinyl or linoleum. Where carpets cannot be removed, vacuum regularly with a high-filtration vacuum cleaner. Use a high-temperature steam-cleaner to kill mites effectively. Products are available that can be sprayed on carpets to kill mites; these are effective but should be used with care if you suffer from respiratory symptoms, and should not be used in areas where children play on the carpet, or on soft toys or pillows. Use a high-filtration vacuum cleaner with filters capable of retaining a high proportion of the smallest particles (HEPA filter, S-class filter or similar). Details of suitable vacuum cleaners are available from Allergy UK. Damp-wipe all surfaces each week (pelmet tops, window sills, tops of cupboards and so forth). Vacuum all surfaces of upholstered furniture at least twice a week. Reduce humidity by increasing ventilation. Use trickle-vents in double-glazing, or open windows. Use extract fans in bathrooms and kitchens. Apply an effective allergen barrier balm around the edge of each nostril to trap or block pollens and other allergens and help prevent a reaction. Allergen barriers are available as balms or gel nasal sprays and some people have found petroleum jelly can help. Ventilation is extremely important. Whether it is windows, trickle vents or an air conditioning system. Ensure that you have clean air in and around you in the workplace. If you have a heating, ventilation and air conditioning (HVAC) unit installed, make sure it is regularly serviced. If ventilation is limited, use an effective air purifier to help remove and reduce allergens such as pollen, house dust mite debris and mould spores. Ensure office cleaners have effective cleaning methods and equipment such as a HEPA vacuum cleaner that will ensure that pollens and allergens are trapped adequately. Take control of your personal desk environment, keep it clear and uncluttered and damp dust twice a week. Drink plenty of water throughout the day and always ensure that you take your prescribed preventative medication if you have asthma or rhinitis.